A price sheet is available for you do your quotes on your own. To Download, Right Click - "Save Link As"
What is the maximum size we can laser up to? What is the maximum thickness you can laser? By laser cutting will I have polish edges? what types of vinyl can you apply onto the acrylic? 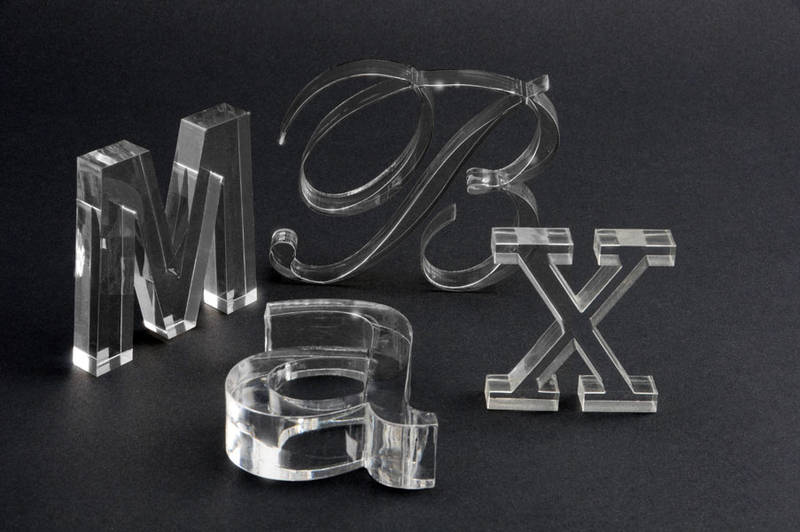 Do you offer direct to print onto acrylic services? Can you install studs behind the acrylic to mount on the wall? What is the minimum order for laser cuts? Can you get this specific color of acrylic in this specific thickness? Do you provide a paper template for installation? How do you ship these to me? 1) Q: What is the maximum size we can laser up to? A: 4 x 8’ – largest we can laser cut is 47” x 97”. If your cut is larger, we can always split your design and then cut upon your approval. 2) Q: What is the maximum thickness you can laser? A: The maximum thickness we can laser is ¾”. 3) Q: By laser cutting, will I have polished edges? A: Yes, by CNC Laser cutting you will have smooth polished edges with a gloss finish. 4) Q: What types of vinyl can you apply onto the acrylic? A: We can digitally print onto adhesive vinyl and apply to acrylic. We can also apply color vinyl such as Oracal 651. 5) Q: Do you offer direct to print onto acrylic services? A: Yes, we do. We have a 4ft by 8ft flatbed UV printer that can print directly on acrylic. 6) Q: Can you install studs behind the acrylic to mount on the wall? A: Yes we have various studs and pads that we can install onto your cut. 7) Q: What is your turnaround time? A: Turnaround time is going to depends on how complicated the job is. For a simple cut out of acrylic, you’ll be looking at 2 business days after payment and approved file is received. If we need to paint or glue sheets together this will extend the turnaround time. 8) Q: What is the minimum order for laser cuts? A: We have a minimum $30 order. 9) Q: Can you get this specific color of acrylic in this specific thickness? A: Most of the colors we have in stock at a wide variety of thickness can be seen listed above. However, with some specific colors and thickness combinations it will be difficult to source. We will suggest gluing pieces of acrylic to achieve certain thicknesses. 10) Q: Do you provide a paper template for installation? A: Yes if you request for a paper template we can provide one. We also provide cut out stencils to make installation even easier. 11) Q: How do you ship these to me? A: With our laser cuts we’ll leave the protective paper backing on the cuts themselves and carefully packaged them to avoid damage during transit. We will ship these out to you via UPS. For larger cuts, we will arrange with you on how we will deliver these items. Our flat cut acrylic sign letters are elegant enough to brighten any dull lobby or front office. However, they are durable enough for outdoor use, thanks to their weather resistant and waterproof design. You can install the acrylic sign letters on any outdoor exterior wall and arrange them to spell out your company’s name. When you choose our acrylic letters for outdoor signs, you can customize your experience by selecting from the various colors and thickness options available. If you want to choose a color that matches the exterior or interior of your office building, you will have the option of doing so. Perhaps, you want to choose a size that is large enough to offer visibility from the street. This is all a possibility when you choose to do business with our company. If you are interested in what we have to offer all you have to do is get in touch with our customer service department. Email us with the necessary information about the colors and dimensions you are looking for and we will be able to give you a free quote usually the same day. We require all files to be vector and sized ready to cut. We take our work very seriously and want all of our customers to be completely satisfied with the finished product. This is why we do all of the cutting and engraving in-house, by utilizing state-of-the-art machinery and CNC laser cutting technology. Our technicians make sure that everything is cut and engraved with precise perfection. When you choose to do business with Signworld America, you can have your acrylic letters for outdoor signs shipped within two business days of the initial order date. We strive for precision and accuracy in every aspect. Your acrylic sign letters will be packaged in a safe-proof shipping box, so they are fully protected during transport. As you already know, acrylic sign letters can make a great addition to any business. However, choosing the right company to design your lettering can definitely reflect the outcome. Please check out the customer testimonials, before placing your order just to give yourself peace of mind.